Verizon To Start Selling iPads Starting October 28 (VZ, AAPLT): "
Verizon Wireless will begin selling Apple's iPad in stores this October 28, the companies just announced. Verizon will only carry the Wi-Fi version of the iPad – packaged with the Verizon MiFi 2200 Intelligent Mobile Hotspot. $829.99 for iPad Wi-Fi 64GB + MiFi. “We’re thrilled to be working with Verizon Wireless to get iPad into the hands of even more customers this holiday season,” Tim Cook, Apple’s COO, said in a canned statement. This news lends credence to reports that Apple's iPhone will FINALLY come to the Verizon network sometime in early 2011. Will Mobile Carriers Now Steal Tablet Sales From Best Buy? Apple's iPad coming to AT&T and Verizon stores on October 28th: "Both AT&T and Verizon announced Thursday that they will begin selling Apple's iPad in their brick-and-mortar retail stores on Thursday the 28th, with the latter offering the device in conjunction with its MiFi mobile hot spots. 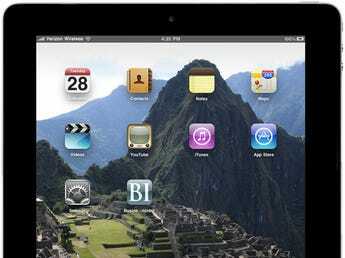 (AP): "AP - Verizon Wireless says it will start selling Apple's iPad and in its retail stores beginning Oct. 28."